I've brought you reviews for popcorn a few times now and it seems each time the products are getting better and better. Today I don't want to talk to you about the popcorn, but what you can top the popcorn with! To do that, let me tell you about my delicious Friday Night with Maggie and Mary's Pop It Top It. Pop It Top It is very easy to make! There are directions to follow on the back of the package that will take you step by step until you have a ready to eat product! Upon opening your brown bag of Pop It Top It, you'll notice everything you need for this product is inside waiting for you. You'll find a bag of microwavable popcorn, a bag of candy coating pieces and a bag labeled with an "S" for the Snickerdoodle topping. After you've finished popping your bag of popcorn, be sure to pull the unpopped kernels out of the bowl. Failing to do this may lead to forgetting they are in your mix and biting down so hard that you may need a dentist. Nobody has time for that, so make sure not to put yourself in that position! Okay, moving on from the life lesson..... Pop your popcorn, then melt the candy coating! Mix together and add the snickerdoodle seasoning. Seems easy enough, right? Make sure you lay your mixture out on a pan or wax paper to let it cool and dry a little. Also a little tip I learned, a single layer on your wax paper will cool and dry a lot faster than a big clump. After waiting patiently for 5 minutes, which seemed like the longest 5 minutes in the history of 5 minutes, I was able to break the pieces apart and devour it! Don't worry, I did take a picture first! My husband was very happy when I placed a bowl of this deliciousness in front of him. He looked at it for a moment and then dug right in! He approved of this snack. For a person that is a big snacker, he isn't too picky but he really did enjoy this product. I agree with him on this as well. The melted candy coating covers the popcorn perfectly and the snickerdoodle topping has just enough butter and cinnamon flavor to make this snack something I would come back to time and time again. Well Done, Maggie and Mary! Disclosure: A special thank you to Maggie and Mary for giving Sweet Cheeks and Savings this opportunity to work with them. We received these items free of charge from Maggie and Mary. No monetary compensation was received or offered, nor were we under any obligation to write about this product. All opinions expressed are honest thoughts. We were not offering any sales or taking orders for this item. We will not receive any compensation in connection with any sales of this item. These are such creative and yummy ways to serve popcorn. They would be great to serve during family movie night. Snickerdoodle popcorn? Sign me up. That sounds amazing. I love flavored popcorn and I just know this is right up my alley! I used to make snickerdoodle cookies, but never thought I would see it made with pop corn. Sounds very good. This looks so tasty! I love popcorn and would love to kick it up a notch. Snickerdoodle popcorn sounds like something I would have to eat slowly to savor each bite. Snickerdoodle packets with the popcorn??? No way! I love that, it's awesome! Well snickerdoodle popcorn would make anyone want to try it. I love trying different flavors on m popcorn but have never seen any that you pop yourself. I would love to try these. I'm definitely going to look into that for my boyfriend. He loves the sweet toppings on his! Interesting and creative. Sounds like a great idea for a circus themed party too. What a fun idea for Popcorn! Love it! Yummy! I love Kettle Corn so I bet I would really enjoy this. And, I'm sure my kids would love it as well! Funny, I have tons of Candy Coating and I never thought to use it in popcorn. This popcorn sounds and looks super delicious! Ever find a product you wish wasn't made? This is it...I would not be able to put it down. Oh my, this looks delicious. I love the thought of eating Snickerdoodle popcorn. I bet my kids would really enjoy this during one of our family movie nights. 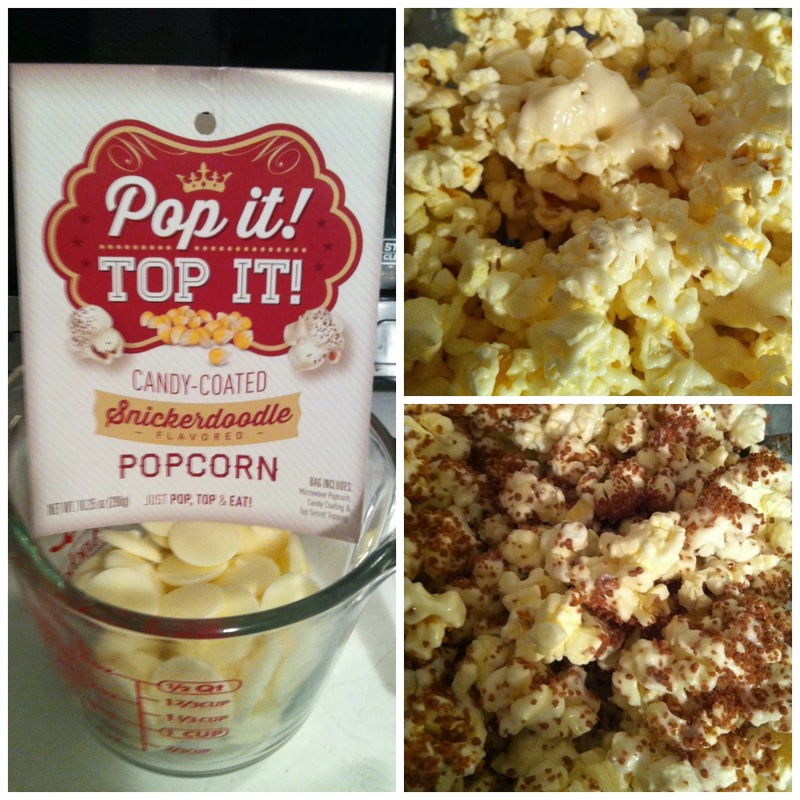 What a great way to change up popcorn and make it fun. I have never heard of Pop It Top It! I just had a look at their website. All their products look delicious! Candy-coated popcorn?! My goodness! My husband would LOVE that! I think I could finally get my daughter to eat popcorn if we did this. Of course, then I'd have to share. It has been so long since I've had popcorn. Seeing these pictures are making my mouth water. I sure wish I had a bag. This looks really good! I love popcorn, and extra toppings make it even better. I love popcorn and occasionally I love to "fancy" it us a bit. This would be a nice special treat on movie night. Wow! This looks really yum!! I so want some RIGHT NOW. I love how they make it so easy to make gourmet popcorn at home! This sounds so yummy for a nice sweet treat! This looks super delicious! 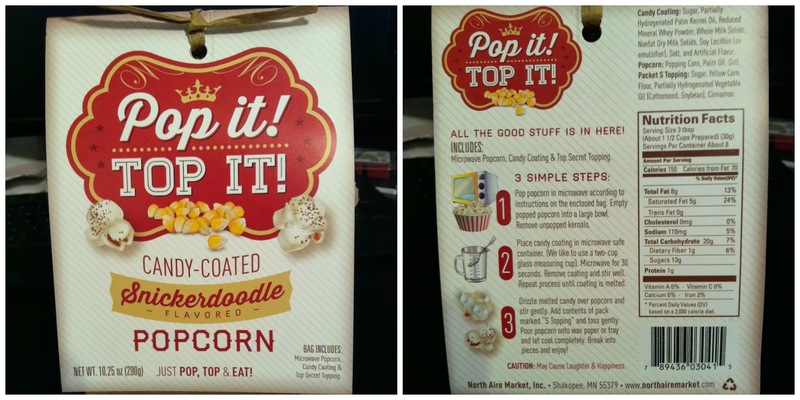 My daughters both love flavored popcorn so I'm sure they would love to try this! Flavored popcorn is my weakness! I haven't heard of this brand before, but my curiosity is definitely piqued! I MUST try this Snickerdoodle popcorn real soon! I love sweets, so this looks like it would be right up my alley. It's been awhile since I had popcorns - yummy! I haven't seen those before, or heard of Snickerdoodle popcorn. What flavors will they think of next! Just the word snickerdoodle would have my kids wanting me to get this. They love the cookie. I'm not big on buying junk food but I have to say that I would love to have this to give it a try. Thanks for the review. Okay I am totally sold. I definitely want to try this. It sounds so delicious and I am pretty sure my kids would love it. What a unique way to enjoy popcorn. It sounds so yummy. My hubby isn't big on popcorn because it gets stuck in his teeth. My son and I on the other hand loves it! I don't think I've given my son sweet popcorn before! Will check my local stores to see if they have the brand you reviewed. That sounds like such a delicious flavor for popcorn! My son is a total popcorn nut, I'll have to check this out more. I could just imagine the popcorn sticking into my gums and the sugary flavour. Love the combo! What an interesting flavor for pop corn. I've forgotten to remove the unpopped kernels a few times and it's not a pleasant experience. It takes all the fun out of binging on a massive bowl of popcorn while losing yourself in a good movie.